The blue satin coat has draped sleeves for a dramatic look and has a Velcro closure in the front. Long green sleeves are attached to the inside of the coat. The matching blue satin hat has a rolled brim and is made of a sturdy foam so it doesn't lose shape. A unique Oz costume for Halloween. 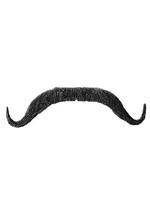 Add a Munchkin Mustache set for a truly authentic look.